First, Mrs. Robinson. No, not THAT Mrs. Robinson. The one I’m referring to taught me in Grade 1 and left a lasting impression. I always laugh because she seemed so old to me back then, though she was probably only in her 40s. She had curly grey hair, was tall and slim, and had an almost melodic kind of voice. Very fitting for the woman who introduced me to music and taught me how to use my voice as an instrument. I will never forget how proud I was when she chose me to be part of the school choir. She also taught me how to spell the word ‘choir.’ I remember she wrote it on the blackboard one day and asked if any of the students could read it. A few had guessed ‘chore’, which was my initial thought too, but then inspiration struck. My hand shot into the air and I proudly said, “ChoreS!” See, I assumed there was an invisible S at the end. Oh, little Julie. Naive little Julie. Next up, Mrs. Parsons, my Grade 5 teacher. I ADORED her. In many ways I wanted to BE her. I was quite tall in Grade 5 and wore my hair similarly to the way Mrs. Parsons did, and sometimes the students would think I was her when I’d first walk into the classroom. Mrs. Parsons inspired me in infinite ways. She embraced my love of music, encouraged me to take piano lessons, and then let me stay in during recess to practice on the piano in our classroom. She was a very accomplished piano player herself and would often play for us during class and teach us new songs to sing. I auditioned for the Christmas play, with her blessing, and I got the part of Tina Tinsel! She spent many hours helping me to polish the role and get the songs down pat. I already loved music, but Mrs. Parsons turned my passion into something that was a part of me. Something I couldn’t live without. She also gets credit for inspiring my love of reading. I remember during one class, I was reading a story called Darcy in Cabin 13. Darcy’s crush had just kissed her on the lips and I guess my eyes nearly bugged out of my head. Mrs. Parsons laughed out loud at my reaction and said, “Julie, I can tell how much you’re loving that book. I can see your eyes from here!” I couldn’t believe a book could affect me like that, could transport me into another world. And with that love of reading, came an immense love of writing that she helped nurture, too. Mrs. Parsons, wherever you are, THANK YOU. Last, but certainly not least, Janet Westbury, my Dance professor at Brock University. I already wanted to be a teacher, long before I met Janet, but she made me want to be a BETTER teacher. I met Janet during my second degree, in Physical Education. I recall the first day I stepped foot into her dance studio. She sat us all down, took out a clipboard and some paper, and went around the room, interviewing us one by one, scribbling notes as she went along. We didn’t know until after that she’d been writing little details about all of us to help her remember our names, and by the end of the period, she knew ALL of us. She told us very clearly that she never, ever wanted us to feel like a number, something that can often happen in a university setting. I loved Janet from day one. I respected her, admired her, and felt such a bond with her that strengthened over the years. I was fortunate enough to take three courses with her. Throughout our time together, we developed a friendship that’s still going strong, years after I’ve graduated. I babysat her kids, she attended my mother’s funeral, we email each other, and we even call from time to time to catch up and gab about our many adventures in teaching. I mention Janet’s name in every interview and talk about how special she made me feel. Teaching, to me, isn’t simply about disseminating information; it’s about connection. 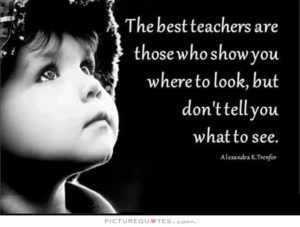 Students don’t care about what you know until they know that you care. That’s the greatest life lesson of all. Thank you, thank you, thank you, Janet Westbury! A very nice post. I have no doubt that one day, one of your students will honor you in such a way! What a lovely, lovely post. Janet’s line about caring is one I’m going to tuck away until I need to dazzle someone in a boring meeting someday. That sums it up so well! Believe it or not, I too had a Mrs. Parsons in my life, and although she made a lifelong impression on me, she was the opposite of the caring/nurturing teacher you so fondly remember. *shudders* Also, I’m laughing, wondering how far innocent little Julie’s eyes would bug out today, reading some of the stories you have now written! Ha! Now we know where it all started…with Darcy, in Cabin 13. Sorry your Mrs. Parsons wasn’t a good apple. I wish you could have met mine. Very nice post and a lovely tribute to some of the teachers that inspired you. It’s funny the memories that pop up in your head about certain teachers. I remember in Kindergarten that back then one of the things you had to know how to do to go on to first grade was how to tie your shoes. When it came time for me to tie mine in front of Miss. Statts, I couldn’t do it on my own shoe. So she had me tie her shoe. Isn’t that a funny memory to retain? Previous post Weekend Writing Warriors #10! Next post Weekend Writing Warriors #11!